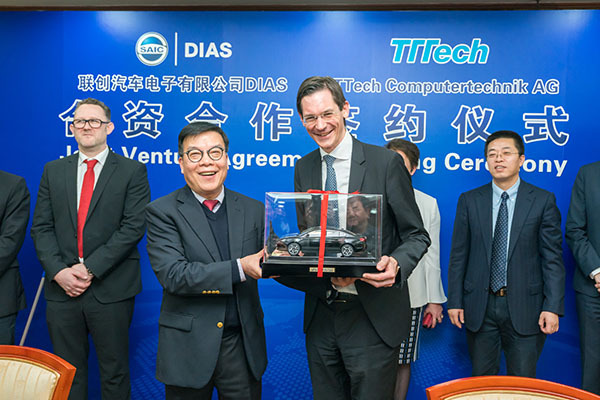 Today, SAIC Motor Corporation (hereinafter referred to as SAIC Group) and Austrian TTTech Computertechnik AG (hereinafter referred to as TTTech) have signed a joint venture contract. SAIC and TTTech will set up a joint venture company, with a 50.1:49.9 ratio in shares, to accelerate the integration and development of the intelligent driving control central system (iECU) and enhance the core technological capabilities in the intelligent driving field. This move will further consolidate SAIC Group’s first-mover advantage in intelligent driving technology and ensure that its own brand of intelligent driving cars will be the first mass production in China that is planned to be launched this year. With its product MotionWise, TTTech is the leading global provider of a safety software and integration platform for groundbreaking automated driving. As an expert in safety technology, TTTech provides robust networking and safety controls, that as the nervous system for advanced control solutions in the automotive, aerospace, construction machinery and other industrial sectors. Also, TTTech’s technology solutions have been applied to leading global space applications. SAIC Group is China’s largest auto group, ranking 41st in the 2017 Global 500 list, and 7th in the global automotive industry. In recent years, SAIC Group has continued to accelerate its innovative development strategy in the fields of electricity, intelligent networking, sharing, and internationalization. The company is shifting from a traditional manufacturing enterprise to becoming a comprehensive integrated automotive products and service provider for consumers. As a leader in the field of intelligent driving in China, SAIC Group started independent research on intelligent driving system key technologies as early as 2013, and went into strategic cooperation with international leading companies such as Mobileye, Infineon, China Mobile, Huawei, Invista and Qualcomm. SAIC Group has acquired profound technological expertise in high-speed and intelligent driving technology in urban areas, iECU technology, V2X vehicle application key technologies and high-precision map technology. At present, SAIC Group conducts research on intelligent driving technologies in closed test areas such as highways, special parks and urban ground and underground parking lots. The accumulated mileage of vehicle testing exceeds 50,000 kilometers. In March of this year, SAIC Group was awarded the first domestic intelligent network-linked automobile road test license that will effectively promote SAIC’s intelligent driving technology to take the lead in mass production. As a first step, SAIC Group will launch an intelligent driving production model this year under its self-owned brand. It aims to realize intelligent driving functions under specific scenarios such as “last kilometers autonomous parking”. According to the plan, the joint venture has a registered sufficient equity and will be engaged in the development, manufacturing and sale of advanced driver assistance systems, automated driving electronic control units and related components. The portfolio includes self-produced products sales, wholesale, import and export as well as services for the domestic market including market development, technology development, technical consulting and after-sales services. The Intelligent Driving Central Controller (iECU) produced by the joint venture will be installed on the first domestically produced intelligent driving vehicle that SAIC Group will launch this year. A pure electric high-end model – the production version of the Roewe Wings concept car that can realize intelligent driving functions such as “last kilometer autonomous parking” – will allow for an utterly new driving experience for consumers. Chen Zhixin, President of SAIC group exchanging gifts with Georg Kopetz, member of the executive board of TTTech.